In order to fulfill the divergent demands of the customers, we are engaged in manufacturing, trading and exporting Bone China Crockery. 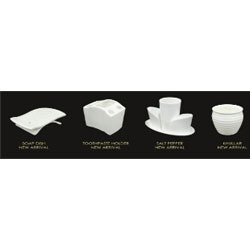 The range offered by us consists of Bone China Toiletries, Dotted Bone China Crockery, Bone China Kitchenware, Hotel Ware Bone China, Bone China Teapot and many more. 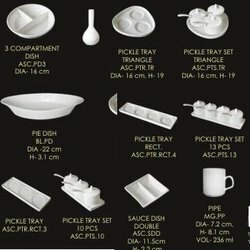 These crockeries are manufactured under the guidance of experienced professionals, who strictly follow the established norms of the industry and utilize quality-tested material procured from the reputed vendors of the market. 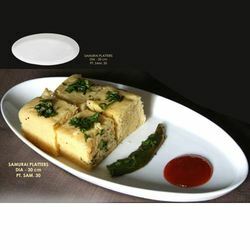 To furnish the diverse requirements of our clients in the best possible manner we are involved in offering an extensive range ofBharat Bonechina Urmi Full Plate 10".Dia 10.5" white bone china full plate without rim. 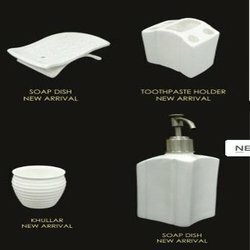 Innovation is our forte and we strive to manufacture, supply and export a commendable range of Bone China Toiletries. Offered toiletries are developed at our sound manufacturing unit, by using quality-approved material and employing advanced machines. Also, our professionals follow the norms and standards of the industry while manufacturing these toiletries. Before the final dispatch, these toiletries are rigorously tested on different parameters to ensure their flawlessness. 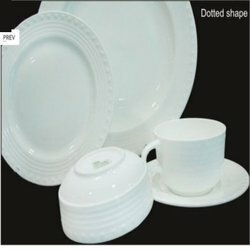 To furnish the diverse requirements of our clients in the best possible manner we are involved in offering an extensive range of Dotted Bone China Crockery. Backed by our vast experience of this domain, we are engaged in manufacturing, supplying and exporting Bone China Kitchenware. These kitchenware are manufactured by using optimum quality material and following established guidelines of the industry. Also, a team of experts keep vigil on the entire production process, so as to manufacture superior quality kitchenware and remove flaws, if any. All these products are stringently tested on variegated parameters of quality, before the final delivery. 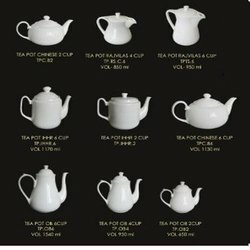 With an objective to fulfill the demands of the customers, we are engaged in manufacturing, supplying and exporting Bone China Teapot. These teapots are manufactured under the supervision of experienced professionals, who strictly follow the industry norms at every stage. To manufacture these teapots, our professionals utilize optimum quality material obtained from the authentic vendors of the market. 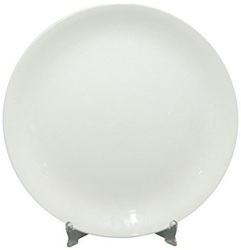 To furnish the diverse requirements of our clients in the best possible manner we are involved in offering an extensive range of Bone China Oval Platters. 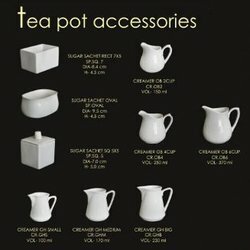 To furnish the diverse requirements of our clients in the best possible manner we are involved in offering an extensive range of Bone China Teapot Accessories. Owing to the immense experience and a competent team of experts, we are able to offer Kitchen Platters to respectable clients. 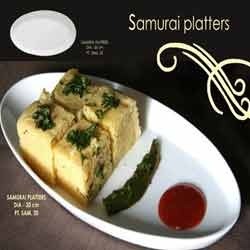 These platters offered by us are made utilizing high grade raw material, which is sourced from trustworthy vendors of the market. In addition to this, the offered range of platters is suitably checked on different parameters to ensure its adherence with the international quality norms and standards. To furnish the diverse requirements of our clients in the best possible manner we are involved in offering an extensive range of Serving Bowls. 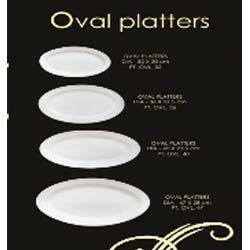 In order to cater to the diverse requirements of honorable clients, we are able to offer Oval Platters. 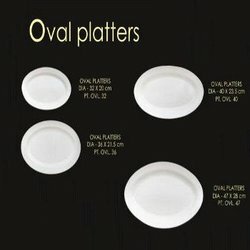 The offered range of oval platters is made utilizing high grade raw material and highly advanced technology in strict compliance with the international quality standards. 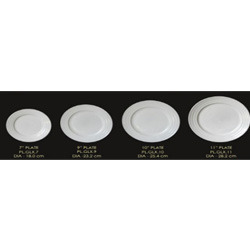 Along with this, the offered range of oval platters is suitably tested on different characteristics to ensure that flawless products are delivered at customers' premises. Backed by the profound experience of the industry, we are engaged in manufacturing, supplying and exporting Cups and Saucers. All these products are manufactured under the supervision of experienced professionals, who strictly follow the established norms and standards. Also, our professionals utilize modern machines and optimum quality material to manufacture these cups and saucers offered by us. Before the final dispatch, these cups and saucers are stringently examined on different parameters of quality. 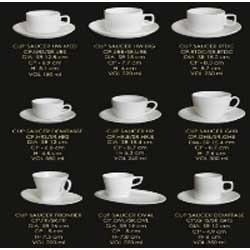 We also offer these cups and saucers in custom-built range, as per the requirements of the patrons. 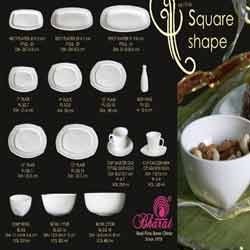 Leveraging on the experience of our professionals, we are engaged in manufacturing, supplying and exporting Dotted Shape Crockery. These Crockeries offered in various specifications and also in custom-built range, in order to match the requirements of the patrons. In order to develop quality range of Crockeries, our professionals high quality material and follow the established guidelines of the industry. To furnish the diverse requirements of our clients in the best possible manner we are involved in offering an extensive range of Galaxy Platters. 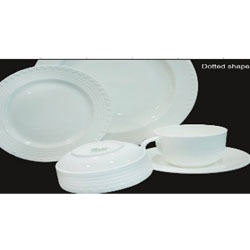 To furnish the diverse requirements of our clients in the best possible manner we are involved in offering an extensive range of Hotel Ware Bone China Crockery. We are one of the leading organizations engaged in manufacturing, supplying and exporting Serving Bowls. 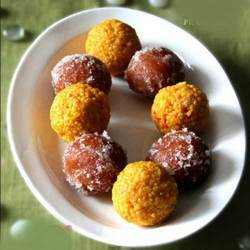 The serving bowls offered by us are manufactured by employing advanced machines and using quality-approved material procured from the authorized vendors of the market. 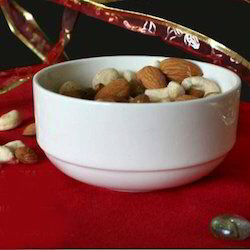 Manufactured in accordance with industry laid norms, these bowls are checked on certain parameters of quality and then forwarded for the final dispatch. To furnish the diverse requirements of our clients in the best possible manner we are involved in offering an extensive range of Stylish Bone China Crockery. 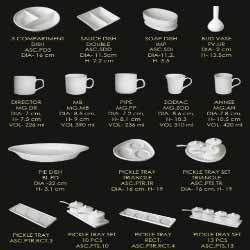 Looking for Bone China Crockery ?